Clarkston has a simple formula for winning State titles. Its about family, training, no superstars, racing at no 'racetracks' and team pack running. 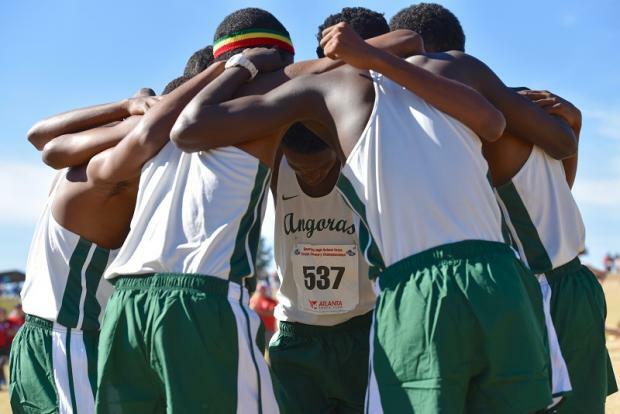 It works, as the result is 3 consecutive State XC titles. Do teams fear them or get psyched out..? Bineyam Tumbo was the only runner to earn All State status, placing 7th overall at 17:12. Where the Angoras do their damage is from 2-5, with a split there at :48. One of their top guys was #6 at State also, so it could have been a larger margin of victory. Bosco Hakuzimana placed 12th and Thomas Weldemichal 16th. Early leaders on the top of the first hill. Its a blessing in XC to have footspeed. I know about all the blah, blah about place for team, but when gunning for an Individual title, 'speed kills' in that final 800m stretch. 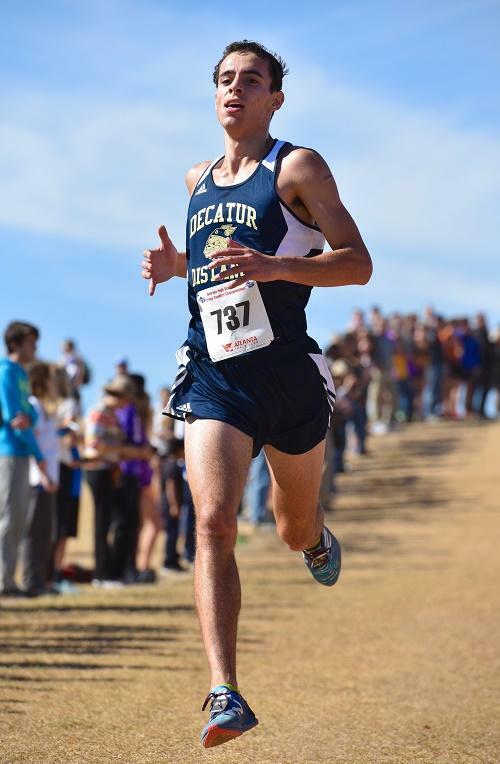 Sam Ellis of Decatur has that in spades, as well as strength, being a 800/1600m Track Champion. Ellis held off a wild sprint by Nick Nyman of Starrs Mill the final 100m to win the Overall title in 16:38.61. Sam Ellis takes the lead on Separation Slope from Harry Harp. Sam Ellis charges to victory down the Horseshoe Hill. 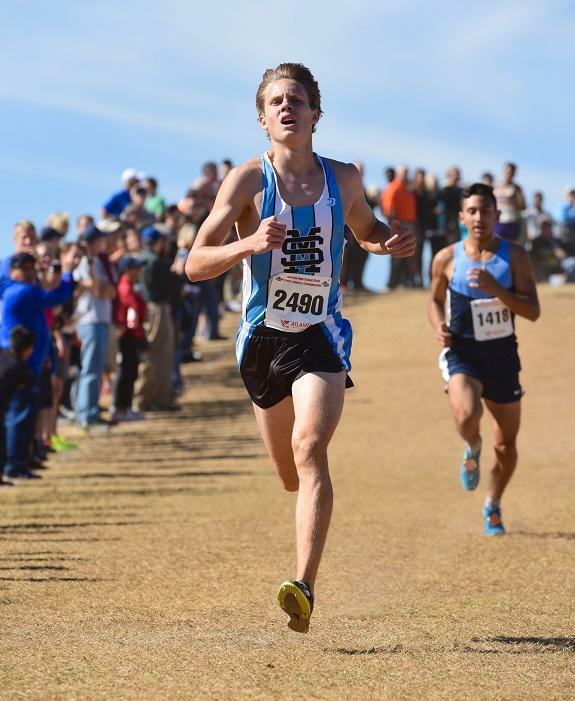 Nick Nyman was runnerup at 16:39.07, which boded well for Starrs Mill as they raced to a 2nd place team Podium finish. Harrison Fultz pitched in with a 13th place effort of 17:29 to give the Panthers a 10 point gap over 3rd place Union Grove. The Wolverines did run well, led by Matt Seitz in 11th at 17:24 and some help from frosh Domonic Macias' 17th at 17:53. Coach Spinks had his Eagle's Landing squad primed to run well at Carrollton and did they ever, grabbing the final team Podium spot led by Antaures Jackson's 9th place finish of 17:25 and Jonathan Respress' 18th at 17:53. Whitewater finished 9 points behind for 5th led by Harry Harp's 5th overall at 17:01. 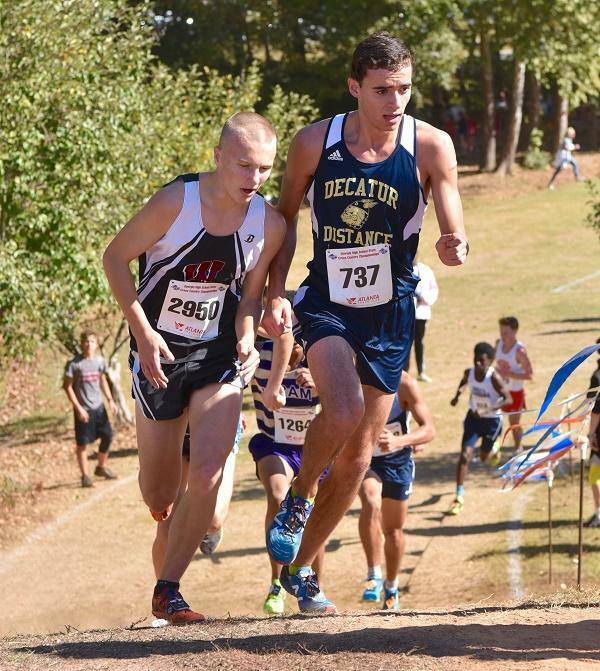 Nick Nyman of Starrs Mill leads Issac Hernandez from Johnson HS on the final downhill. Rounding out the All State squad, not mentioned above were: Issac Hernandez of Johnson HS (Gainesville) who had a banner season, capping it off in 3rd place at 16:40. Junior, Audrick Pyronneau had a nice race as well for Hiram, taking 4th overall at 16:49. 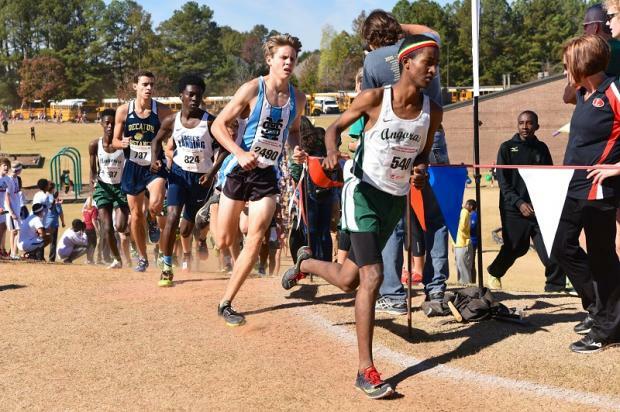 Region 4-AAAAA champ Deonte Lee of Ola raced to 6th at 17:10, William White of Clarke Central repped the Glads' taking 8th at 17:16 and Vladimir Zander-Velloso of McIntosh took 10th at 17:23. 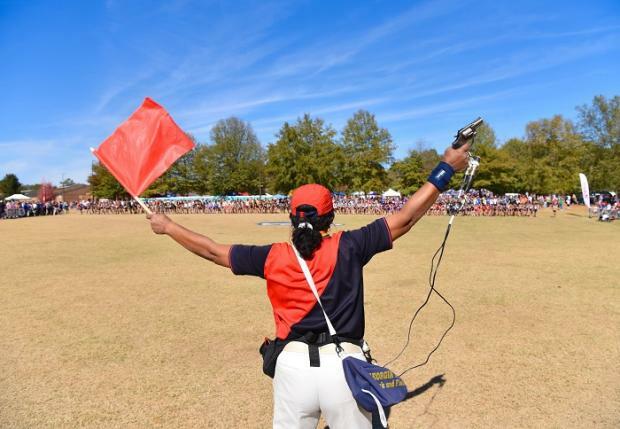 Legendary USATF Official & Starter, Jacqui Collins, pulls the trigger for the 5A boys start.